He recently wrote a piece for The Nation, “We Can Fight Trump’s Cuts to Essential Government Programs,” which states: “Mick Mulvaney, has assembled a ‘hit list’ of agencies and programs to eliminate. … The proposed cuts have everything to do with right-wing ideology and nothing to do with fiscal responsibility. All of the programs slated for closing provide essential public services. All of the programs slated for closure, plus the proposed Planned Parenthood cuts, cost the federal government a combined total of about $3 billion per year. That grand totally amounts to one-half of one percent of, the current Pentagon budget, now runs at about $600 billion per year. And that’s before Trump’s pledge to throw an additional $1 trillion at that bloated department over the next ten years. 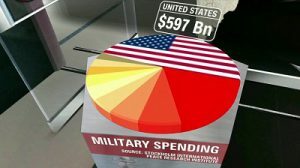 “The President plans to increase Pentagon spending by $54 billion, claiming that the U.S. military is broken and depleted. Mr. Trump recently spoke to service members aboard the new $13 billion USS Gerald R. Ford aircraft carrier reiterating his call for more spending. Ironically the carrier is a real-life example of why more spending is not needed. U.S. military capabilities far outstrip all other nations. The carrier is an addition to a navy that was already unmatched by all others. With ten carriers, the U.S. has more than all other nations combined and the carriers are larger, providing more deck space per carrier than other nations. The U.S. Navy has thousands of aircraft, making it the second largest air force in the world behind the U.S. Air Force. The U.S. already spends almost three times what any other country spends on [the military] and more than the next nine countries combined.